Thushani Rodrigo has always amazed me. From the very first day I met her, I have been in awe of her strength, courage and grace and constantly impressed by her creativity. 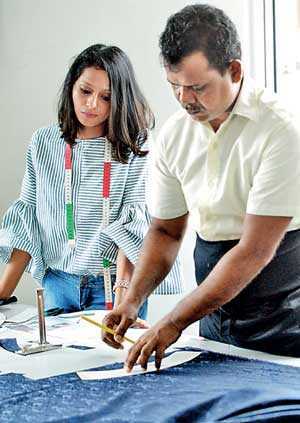 The discipline and commitment she brings to her work, her farsightedness and her attention to detail have brought her quite far and she will surely journey further still, with an exciting chapter opening up next week as she launches her new store Todos in Rajagiriya. 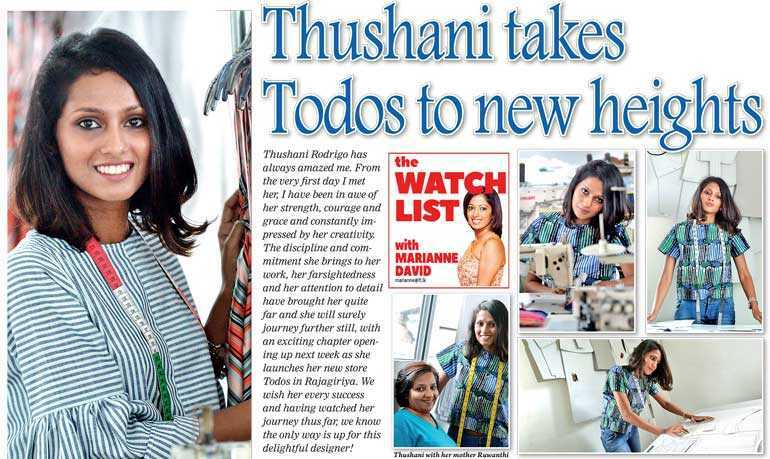 We wish her every success and having watched her journey thus far, we know the only way is up for this delightful designer! Q: You’re opening your new store soon. What’s it called and where will it be located? A: After years of operating from my home, I will be moving to a much more spacious location closer to Rajagiriya. I am excited to announce the opening of this new store, Todos, at No. 384, Kalapaluwawa Rd, Rajagiriya I am extending a special note of thank you to my customers who had trust in me and made it all the way to Angoda during the last few years. If not for their support I wouldn’t have made this journey. Q: You were born without the ability to hear and had to face a lot of challenges in terms of communicating and in school. Discovering the world of sewing opened up a whole new world for you. Could you tell us about how you first started sewing and discovered your passion and ability? A: I still remember how my grandmother used the sewing machine. She was such an amazing dressmaker and I used to watch her making dresses for me when I was a child. My first childhood experience in sewing was fiddling with hand embroidery kits which my mum bought for me. Then at the age of 15, I joined the Singer School of Dressmaking, where I learnt needlework and further pursued my studies there in completing the sewing diploma. Since then I have been involved with crafts and making dresses for family and friends. Sewing was always my passion. I have had my collections for sale on a small scale at a few places, including Good Market on Saturdays. However, a consistent and small collection will come out from 1 July through my own store. Q: You started out with sewing, not designing. When did you first realise you wanted to be a designer and how did you go about realising your dream? A: It was just an unintentional step that came my way. Customers used to ask for recommendations and views. I always had a flair for sketching. So it complemented both aspects and I used to design outfits for some of my customers. It was a blessing and a good feeling that most customers liked my designs. Q: Could you outline your professional education in this field? A: After leaving school a bit early in life I started my sewing diploma at Singer School of Dressmaking. This was the professional foundation of my career. Q: You don’t restrict yourself to any particular style and work on just about everything! But what do you love creating most? A: As a dressmaker, I like to turn out what the customer wants. Personally I like to work on intricate designs, bridal and party wear. I enjoy doing handwork and embellishments on clothes. Q: Your ability to focus single-mindedly on the task at hand to the exclusion of absolutely everything else is amazing. Could you explain your work process? A: Quality and delivering the order on time are the most important to me. So far I have lived up to this to a great extent. My customers will see even a better process in the future. I make all patterns myself and inspect the construction process closely. I have a team of experienced staff including sewing operators and hand workers who have been with me for few years. They are my greatest strength. I am now geared to handle more volume than before with a better turnaround time. Q: Are there any designers who inspire you? A: Yes, of course. There are a couple of them. I am fascinated by Zac Posen whom I believe is so talented. Locally, I admire Darshi Keerthisena for her taste in colours and attention to detailing in the art of batik. Q: Do clients give you the space to create what you envision or do they limit you in terms of what they have in mind? A: It’s a mix of both. Since of late many of my customers gives me a free hand to bring my work to their clothes. I believe it is a great achievement. Q: Your mother, who recognised your talent early, your father who gave up his job to stay home with you, your twin brother, and your extended family have always supported you in following your dreams. Could you tell me about their role in your success? A: I am so lucky to have such a supportive family around me. Without them my journey would have taken much longer. Every member of my own and extended family have played an important role at some stage in my life. My father gave up his job for me at very early stage, then my mother did the same recently. My twin brother is the closest friend I have who boosts my morale. My grandparents looked after me like their shadow until I gained better hearing through the implant. My aunts support me without boundaries and my uncle, Damien Ellawala, my mentor and partner in business, takes me through the insights of the industry day in day out. All of them have been around me like pillars of strength. Q: Life changed for the better when you had a cochlear implant, which enabled you to have conversations with other people and also helped you to take your sewing to another level. Now you are about to open a store of your own. How does it all feel, looking back on the journey that got you to where you are now? A: I had many challenges in my childhood. I had difficulty with my academics. I had limitations in communication. The cochlear implant was the step to a new lifestyle. I had the implant at the age of 18 and it took some time for me to get used to it. My improved hearing helped me to be independent. Today I communicate with my customers freely. I have the confidence to lead an independent life just like any other person. Q: You have not let your impairment be an obstacle to your success. What is your advice to others in following their dreams despite challenges? A: I was truly passionate to sew and just continued doing so. My impairment was never a reason to slow down. I communicated the way I could but strived to work better. Be truly committed to doing what you like and your dream will come true.